Eye cancer patients face an unenviable dilemma. They must enter treatment knowing that their surgeon's strategy to kill the deadly tumor with radiation may also sacrifice their eyesight. Now, UCLA researchers have discovered that a commonly used substance called silicon oil shields the eye and appears to protect vision in patients undergoing radiation therapy for ocular melanoma. The American Medical Association's Archives of Ophthalmology publishes the findings in its July edition. "Vision loss is a devastating yet common side effect of radiation therapy," said Dr. Tara McCannel, assistant professor of ophthalmology and director of the UCLA Ophthalmic Oncology Center at the Stein Eye Institute. "Until recently, physicians focused on killing the tumor and considered vision loss secondary. Our results suggest that silicon oil offers a safe tool for protecting the patient's vision during radiation." Ocular melanoma forms in the pigmented layers under the retina and is the most common eye cancer to strike adults. The National Eye Institute reports some 2,000 newly diagnosed cases of the cancer, roughly seven in 1 million people, each year. The cause remains unknown. Surgeons treat ocular melanoma by stitching a gold plaque containing radioactive seeds to the white of the eye and removing it a few days later. While radiation kills the cancer cells, it also causes irreversible injury to the optic nerve fibers and macula, the section of the retina responsible for central vision. Radiation damage to the macula weakens the blood vessels feeding the eye, causing bleeds and wiping out circulation. Even when the radiation successfully destroys the tumor, the eye structures remain extremely fragile and prone to atrophy, which can lead to vision loss. "If patients survive the cancer, more than half will suffer vision loss in the treated eye six months to three years later," said McCannel, a vitreoretinal surgeon who is also a member of UCLA's Jonsson Comprehensive Cancer Center. The risk for blindness increases over time. The UCLA technique takes place immediately before the patient's eye is exposed to radiation. Patients first undergo an exam to measure baseline vision before treatment. McCannel next removes the vitreous gel, which supports the interior shape of the eye. She replaces the gel with silicon oil, an FDA-approved substance often used to hold the retina in place during surgery to repair retinal detachment. After removing the radiation plaque from the treated eye, she flushes the oil away with saline, which is eventually replaced by the patient's natural fluids. "We discovered that silicon oil absorbs nearly 50 percent of the radiation," she said. "The substance acts like a physical shield, reducing the amount of radioactive rays that reach the back and sides of the eye. We hope that silicon oil's ability to block radiation translates into better vision for patients down the road." Already widely used in retinal surgery, the oil doesn't interfere with the tumor's treatment, and its transparency allows both the surgeon and the patient to see through it. The UCLA team used three approaches to demonstrate that silicon oil absorbs 50 percent of the radiation rays. While more long-term research is needed, early follow-up with McCannel's patients showed that their vision returned to baseline levels without interfering with their tumors' response to radiation therapy. The study was supported by unrestricted grants from Research to Prevent Blindness, the George E. and Ruth Moss Trust, and the Frederic G. Rappaport Fellowship Award. Sponsors had no role in the design or conduct of the study. The UCLA Stein Eye Institute, established in 1966, is a world-renowned center dedicated to the comprehensive preservation of vision, care of eye disorders and prevention of blindness. Through community outreach, the institute has provided free ophthalmic care to hundreds of people who otherwise could not afford contact lenses, glasses, eye care or surgery, including uninsured families, low-income youth and children who require contact lenses for congenital and infantile cataracts. 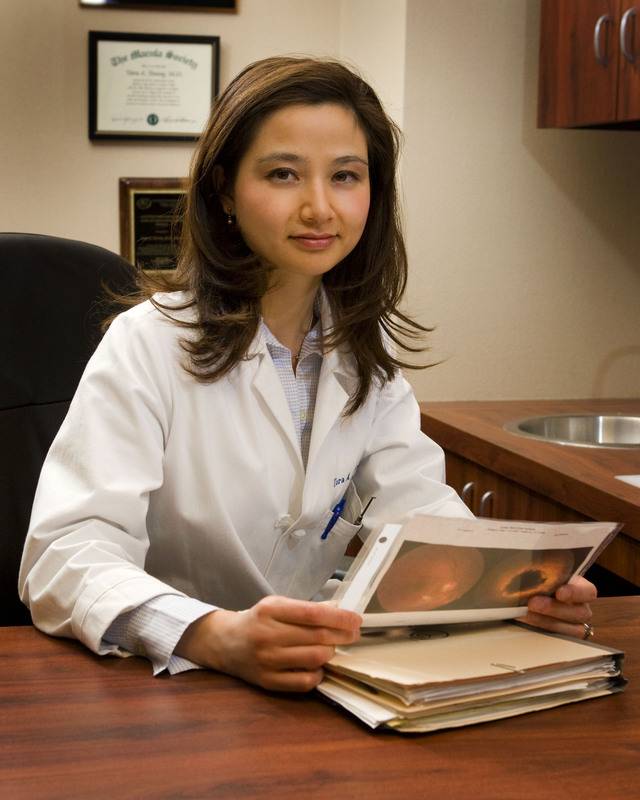 For more information or to make an appointment, call 310-825-5000 or visit uclahealth.org/eye.